Thule van ladders give you easy access to the roof of your van and its cargo. Choose a 4-step campervan ladder that fixes on the rear of your vehicle. 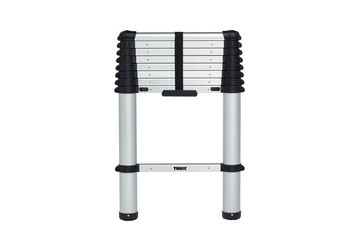 Or how about a clever, moveable and flexible ladder that can be used with a magnetic fixation kit for extra stability? This compact, telescopic ladder can be extended to the height you need while safely supporting you and the load you’re carrying. Whichever Thule van ladder you choose, you’ll be sure of an attractive, modern design that only uses high-quality materials. Our campervan ladders are made from lightweight anodised aluminium and come with rustproof fastening components to ensure a long lifetime of use.